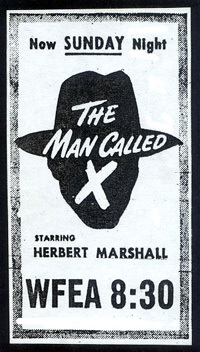 The year 1941 proved eventful for Manchester's first radio station. It became a member of the NBC Basic Red Network. 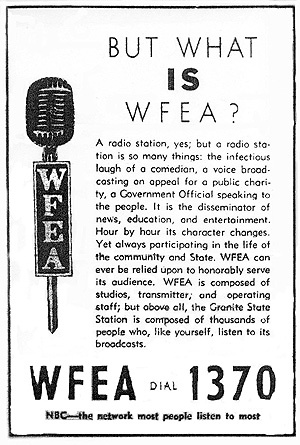 On March 29, 1941, WFEA changed its frequency for the third and final time. At three o'clock in the morning, the North American Regional Broadcast Agreement (NARBA) went into effect to ease overcrowding on the AM band. All stations operating at a frequency higher than 740 kilocycles moved to new dial positions; WFEA moved to 1370. 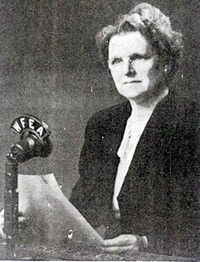 On December 19, 1941, WFEA was granted permission to increase its power output to 5,000 watts. 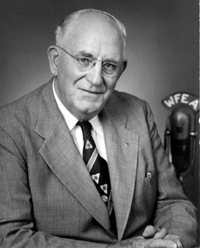 On November 28, 1944 the FCC approved the sale of WFEA to Pittsburgh Sun-Telegraph publisher Harry M. Bitner for $150,000. Bitner assumed control on December 15th; Melvin C. Green was appointed general manager. 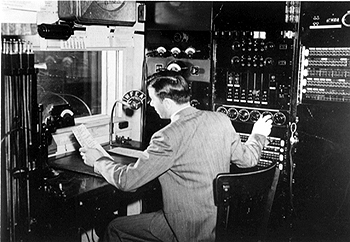 The following May, New Hampshire Broadcasting Company also sold WFEA's Merrimack transmitter building, towers, and 20 acres of land to Bitner. 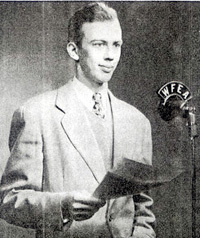 In June, 1945, the station said goodbye to NBC and reaffiliated with CBS, while maintaining the Yankee Network affiliation. On October 5th Bitner applied for an FM license, a story that would play out unsuccessfully three years later. The new year 1946 meant a new home. 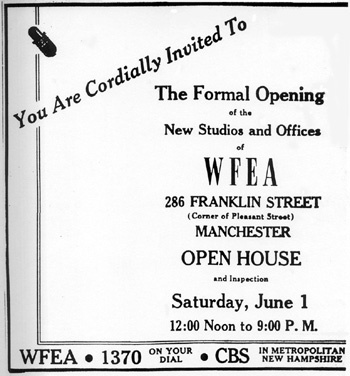 On January 27, WFEA moved its studios across the street from the Carpenter Hotel to a former private home at 287 Franklin Street. 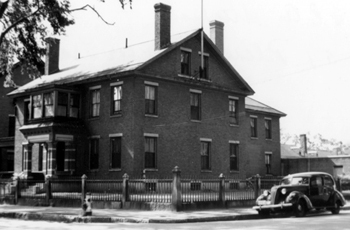 An open house was held on June 1, 1946. An in-house group, The WFEA Trio, performed live music every weekday on Your Luncheon Serenade and Your Dinner Serenade. 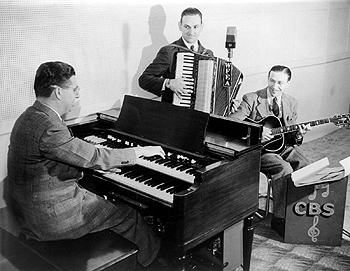 The group consisted of keyboard player Roger Barrette, accordionist Ernie Woessner and guitarist Gerry Kearney. 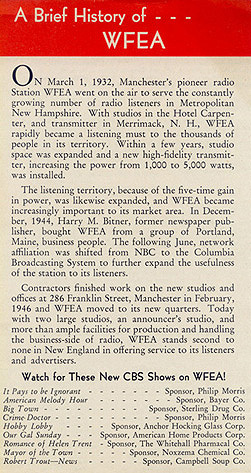 In January, 1947 WFEA and WMUR (610kc, now WGIR AM) announced joint plans to enter the emerging frequency modulation market by applying for FM licenses. Their plan was to jointly operate from one building atop the 1,329-foot Mount Uncanoonuc in Goffstown, NH. 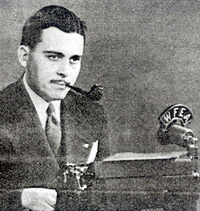 WFEA was awarded a conditional grant for WVMA FM (101.1kc, 3.4kw) in October, but in February, 1948 licensee Harry M. Bitner sold the stations to N.H. Broadcasting Company, Inc., and the construction permit for WVMA FM expired in September (WMUR was more successful and today WGIR FM operates from Mount Uncanoonuc on 101.1mc). Bitner owned WFEA for just over three years when he sold to N.H. Broadcasting, Inc. for $186,661. The principals were brothers Henry and Morris Silver, owners of a successful Manchester bottling company and beverage distribution business, and Samuel G. Camaan, owner of Pariseau's Department Store. They installed Arthur I. 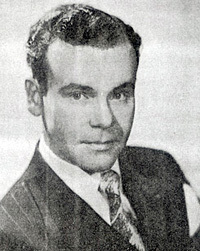 "Roxy" Rothafel as station manager. 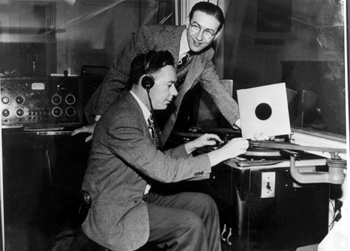 entertainment, disc jockeys like Chuck O'Neil and Gerry Kearney played popular music from large discs known as electrical transcriptions.